Browse: Home / Sow stall phase-out: is 2022 good enough? Sow stall phase-out: is 2022 good enough? On Monday, April 29, the Retail Council of Canada and its member grocers (Co-op Atlantic, Canada Safeway, Costco Wholesale Canada, Federated Co-operatives Limited, Loblaw Companies Limited, Metro Inc., Sobeys Inc., and Walmart Canada Corp.) announced its commitment to phase out the use of sow stalls by their pork suppliers in favor of “alternative housing practices” by 2022. This is a significant decision for improving the welfare of sows, as these retailers account for the majority of the pork produced in Canada. But, is the 2022 date good enough? From the animals’ perspective, given the inherent cruelty of the intense confinement and the suffering sows endure when kept in stalls, the phase-out should be done immediately. Producers, however, argue that time is needed because the replacement of current production systems by alternative systems would be costly. Financial arguments do not justify a nine year phase-out period. First, barn equipment and sow stalls corrode and break down needing to be replaced at regular intervals. This is something that producers must normally plan for as part of their operations. Second, many of the industry’s existing barns are reaching the end of their useful life. Replacing these barns with less expensive hoop-barns to house gilts and sows in groups on straw can significantly reduce the financial pressure on producers while improving sow welfare. In this regard, Manitoba, the province with the largest number of breeding sows, is in a unique situation. Producers might also be reticent to move to alternative systems to raise sows, and thus pressure decision makers for delayed phase-outs, as alternative systems require husbandry skills that producers might not have and time that they might not be willing to spend with the animals. Possessing adequate husbandry skills, and spending time attending to the animals should be basic requirements for any producer in any animal agriculture system. This should not require nine years to learn. Taking into consideration cost realities of phasing out sow stalls in Canada, CETFA has repeatedly asked that sow stall systems be phased out by 2017, giving producers a period of time to make the transition and be better aligned with the shorter periods adopted in the many other countries and U.S. states where sow stalls have been, or are being, phased out. 1. Friesen, R., 2010, December 16. Clock ticking on open sow housing decisions. The Manitoba Co-operator, page 31. 2. Wiebe, L., 2011, January 13. New Farm Safety Code A Slow Fix. Winnipeg Free Press, A6. • Contact the Retail Council of Canada (contact information here).Thank them for their decision to announce a phase out of the use of sow stalls by their members’ pork suppliers in favor of “alternative housing practices.” Express your concern that 2022 is too long a phase out period and not justifiable. Ask that they require that sows group-housed in alternative systems be provided with much-needed straw for bedding and to fulfill the animals’ need to root, chew, investigate and play. 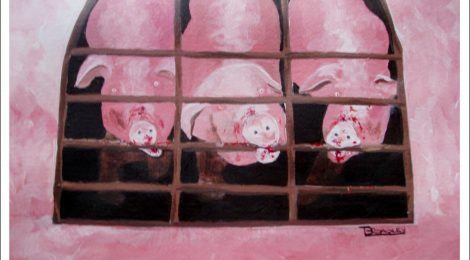 • Consumer pressure can help make the phase out of sow stalls happen faster: go meat free, or refuse to buy pork products until you are assured that pregnant pigs are no longer imprisoned in gestation crates. • Sign CETFA’s online petition asking Manitoba Pork to phase out sow stalls by 2017 here. Note: this article may be reproduced, provided the original article is properly and fully attributed.